In cooperation with Mohawk Mountain, the Mohawk Mountain Race is sponsored by Steep Endurance at Mohawk Mountain in Cornwall, CT. Normally a ski mountain in the winter, the mountain will be transformed into a super fun course! With its challenging ascents and descents on the ski mountain, it is sure to be a race to remember with sweeping viewpoints of the popping Fall foliage at every turn. With several distances to choose from (5K/10K) and NEW this year, Half Marathon/Marathon options, there's something for every member of the family! T-shirts will be guaranteed to the first 100 pre-registered runners by October 7. ​Refund Policy: There will no refunds and/or no transfers of your registration or bib to any other person. Entry fees collected are used to develop and produce the event, starting well in advance of the race date--including course preparation, race supplies, permits, and administration. Race headquarters will be located near the start line next to the Nutmeg Triple Chair Lift. Parking for the Mohawk Mountain Race will be in the main parking lot in front of the lodge. There is plenty of parking for all! The Mohawk Mountain race would go up the left side of the mountain and up the steep “Wildwood Trail” to the top of the mountain, then traversing over to and down the Timber Trail. Upon reaching the bottom of the mountain, runners work their way over to the right side of the mountain towards the Pine, Laurel and Deer Run Trails, then it’s a short trip down Victor’s Way, then back up the Pine Trail, a quick right onto Ledges up to the top of the mountain. After hitting the summit a second time, it’s down the Mohawk Trail to the finish. That's just one 5K loop! ​Runners in the 10K will do two loops. Runners in the Half Marathon course will run one loop respectively of the 5K course plus additional miles in the Mohawk State Forest. Marathon runners will do two loops of the Half Marathon Course. Will we have water and/or electrolyte drink at the start/finish for the Mohawk Mountain Race. This will act as an aid station for the 10K runners. There will be at least 1-2 additional aid stations for the Marathon/Half Marathon runners in Mohawk State Forest. Keep in mind that Steep Endurance events are "cupless" races. Runners are required to carry their own hydration bottle, pack, or cup. This policy is put into effect in an effort to reduce the amount of waste and adopt a sustainable “green” practice for the race and the sport of trail running. Absolutely No Littering! The race is on Mohawk Mountain Ski Area and Mohawk State Forest property. Please respect that we are using their amazing and beautiful trails for this race. Failure to do so could jeopardize future events at Mohawk. Smoking is not permitted on any of the trails or at any checkpoint by runners (probably shouldn’t be doing during a trail race anyway). Alcoholic beverages are not permitted on the trails at Mohawk. Awards will be presented in the following age groups for both men and women in the 5K/10K races. Runners in the Half Marathon/Marathon will receive special finisher awards with additional awards to the top 3 podium finishers in both overall and masters divisions. You’ve just finished a super challenging one of a kind course! Enjoy your accomplishment, sit back, relax, and don’t forget to cheer on all the runners coming in behind you! We will have the usual spread including bagels, bananas, pizza, non-alcoholic hydration options. **Alcoholic beverages are not provided, but you are welcome to BYOB. There will also be a Food Truck Festival and Craft Fair for you to enjoy after the race! There are plenty of places to stay in and around Cornwall if you want to make a weekend out of it. Click on this link for more information. October is a beautiful time of year in Connecticut with fall foliage close to peak. Average high temperatures range are usually in the 60's with low temperatures in the 40's. That’s pretty much perfect running weather! Mohawk Mountain is a ski area located in Cornwall, Litchfield County, Connecticut. The ski area was built on the northwest slope of Mohawk Mountain by Walt Schoenknecht in 1947. It is a popular destination for both day and night skiers and snowboarders in the Connecticut area. It is also a popular day skiing destination for the New York City Metropolitan Area demographic as it is approximately a 95-mile ride to Mohawk Mountain from Manhattan. This resort is also famous for its pioneering efforts in creating and popularizing the snow gun and artificial snow. Mohawk Mountain ski area was first opened by Walt Schoenknecht, later of Mount Snow fame, in 1947. In 1969, a new Carlevaro-Savio double chairlift was installed. In 1978, a new Hall triple chairlift was installed. In 1989, a tornado destroyed many of the ski area's lifts and trees. While the lifts were reconstructed, to this day the tree destruction is still visible from the base area. 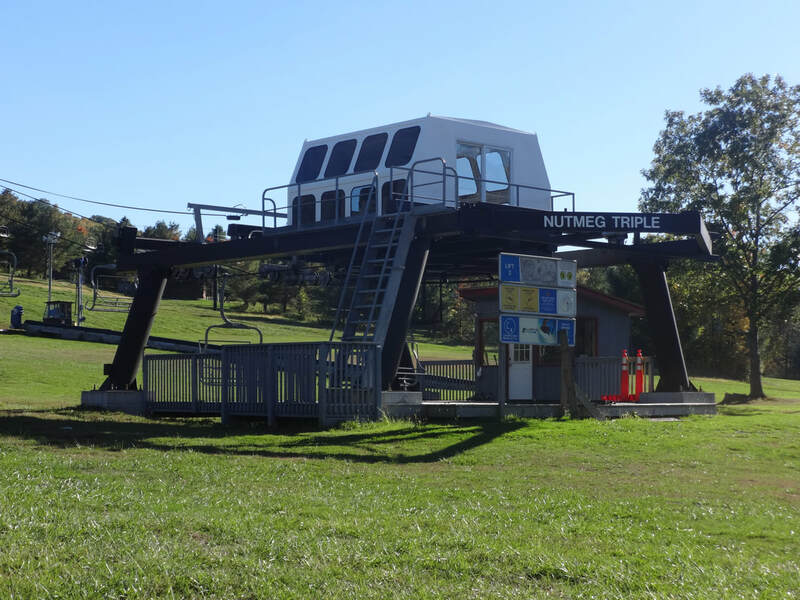 In the summer of 2008, Mohawk Mountain installed a CTEC triple chairlift to replace the Mohawk Double. Formerly placed at Loon Mountain from 1984 to 2004, it is now the Mohawk Triple Chair as seen on their Trail Map.